Applications: Trizact™ 237AA belts give rapid performance when removing scratch marks and scoring on stainless steel tube. They can leave a fine finish, often in one operation. Product Notes: Aligned synthetic abrasive 'pyramids' give rapid performance and can leave a fine finish. These belts can substitute for 2 or 3 stages of normal abrasives to speed up the process and achieve professional results. For Finitube machines, use belt size 675x40mm. Grading of Trizact is different to most coated abrasives. Click the 'More Information' tab for equivalents. 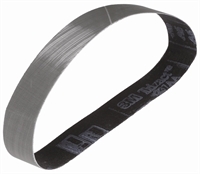 Also Available: We can supply Trizact™ belts for other tube finishing machines. Please contact us for a quote.